Landing in the day and taking off in the day, there was no opportunity for me to carry out my street light index - which gauges how developed a country or state is based on how easy it is to map the city with street lights as guide. From the air though, there was lots of irrigation, ponds, mine holes and mine hills - and quite large ones. The highways are also numerous, criss-crossing amidst flyovers. While Jomo Kenyatta International Airport may be a hub, it is eclipsed by Oliver Tambo's terminals, which are quite large. 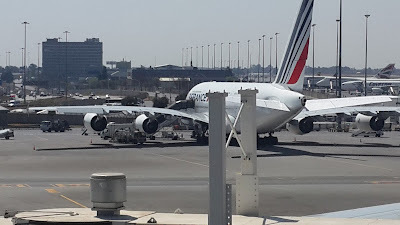 Additionally, there are lots of parking spaces in the airport, where you may have the opportunity to spot two giant double-decker Airbus A380s like we did two days later. At JKIA, our flight back, a bus sized Boeing 737-500ER (this one had legroom) had to wait a while before they could find a parking lot! The airport itself is quite organised. They do inform you of which luggage belt is handling your checked in baggage. Passing through immigration was a breeze, amusingly, the counters manning those who don't require visas to South Africa had few people manning them, hence were longer. Which reminds me of the South African visa - you do need one if you are Kenyan, but surprisingly, it's completely free of charge, for now . There are plans to outsource the processing to VFS, who charge about KSh. 3,200 for handling your processing in addition to what the embassy charges you for a visa - in this case, would mean it will start costing you KSh. 3,200 to have your SA visa processed at no cost. The visa itself takes five days. Checking out from the airport, we did get onto vans, which were just private matatus. Yes, they have matatus over there, with yellow reflectors (not lines, like reflectors which reflect light in the dark). Also, their "nissans" are larger versions of ours, and newer. The roads over in Jozi are quite wide, we started from a two lane highway, before joining a three lane highway and finally a five lane highway. 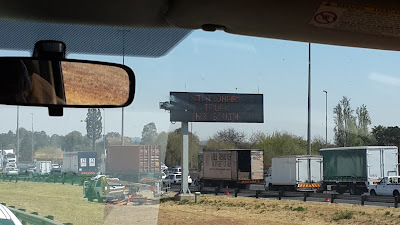 It however took all morning to get to our hotel, due to the lots of traffic on Johannesburg roads. In the two days that we spend in the city suburbs, I felt that there was much worse traffic there than in Nairobi. This is despite their wide roads, where five lanes are common. From the airport, the cause indicated on signs set up along the highway was a truck that had blocked two lanes further ahead the road. We also did manage to spot a road accident, but there was no large crowd milling around the scene, just tow cars and a police vehicle. South Africa does have high accident rates, despite being more orderly drivers compared to Kenya. Well, their matatus do pull illegal turns, but they are fewer and the turns not as daredevil as what you would see in Nairobi - I have seen a matatu in Nairobi attempt to drive up a stair-cased walkway in an attempt to evade police. Another thing about South Africa, well, Jo'burg is that there are damn too many BMWs, and Benzes, and other "expensive" cars on the road. Then, we barely spotted people dashing across highways, as you would do along Mombasa road. We did spot people later in the evening, about 5 pm, as they queued for matatus, which they seemed to do at bus stops around the suburb. They they do have in-car GPS devices. You buy them form an electronics shop, and when meeting up someone, ask them their location, and punch it in to the GPS. I also think they do get some traffic information of their GPS, such as what roads have heavy traffic and alternative routes. Another thing that seems to be responsible for massive traffic in Jozi is the traffic lights, or robots, as they call them. These are in intersections which don't have flyovers. The thing with these lights, is that it is as if they are designed that you will never find a green light. Pass a green light, and the next intersection is red. Wait, turns green, and lo, behold, the next intersection has a red light. I think, if the lights were coordinated to always be green in one way, their traffic would be less of a headache. Surprisingly though, there was no overlapping, and car-dancing in the name of switching lanes. While we did spot a traffic marshal at some point, we barely spotted policemen, just some pot bellied guys in army fatigues at some point. 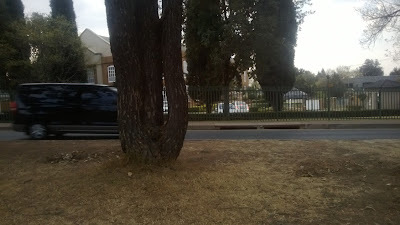 I did mention to you that we were staying around some suburb, the Fourways suburb. Despite having spent hours in traffic to get there, the Jo'burg CBD could only be spotted at the horizon! The suburb itself is well developed, with malls, and offices, but yet the central business district was far, far, away! On the highways, the storm drains have quite large openings - the height of the pavement . They don't look like they are shy about placing storm drains, like we do. Being August, Jozi somehow resembled Ukambani, with brown dry grass everywhere, which might explain the massive irrigation spotted on the airport approach. Also, at some point, there was a billboard on the highway warning travellers that they were entering a "high crime area". A similar billboard in Kenya would have been sawed off for scrap metal, irrespective of whether the area is high crime or not. 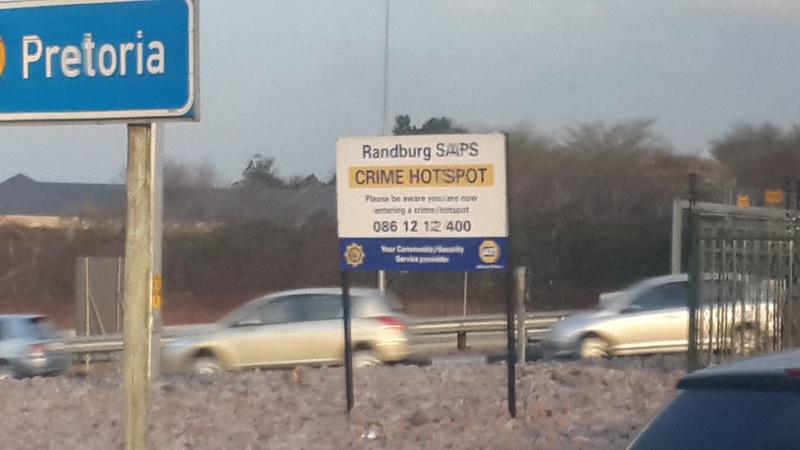 There are lots of crime stories in SA, though what we did experience was passive crime. Despite not having lost our phones to the sprinting window-snatchers of Nairobi, I and some member of my party did somehow lose our phones, despite being in what you would consider low-risk environments. This is despite both phones being valued KSh. 8,000 and below - seems that such are hot gadgets here. Over at the malls, the phone market seems to be a choice between BlackBerry, Nokia and Samsung. No Chinese and few of other commonplace brands in Nairobi. Just across our hotel(which I am deliberately not naming), there was a mini-mall, supermarkets, pharmacies , liquor stores and more. Across, it, there was a Kawasaki dealership, and some more office/retail buildings. Inside the supermarket, there was a wider variety of what you would find in a Kenyan supermarket that claims to have more variety. Also, things were cheaper than you would purchase them in Nairobi. At the liquor store, the prices were far better. Beers, such as Heineken retail at under KSh. 100, compared to KSh. 150 retail price in Nairobi. We decided to walk to a nearby mall, to sample Mr. Price and Mr. Price Home. We did walk through the posh neighbourhood, attracting stares due to the large number of us walking in an area where you barely spotted other pedestrians. The mall, FourWays Crossing would be a larger version of The Junction mall in Nairobi, without the upper floors. It did contain a Mr. Price store, a Mr. Price home store, a number of shoe stores including some label I can't remember, an electronics store, a KFC, and a liquor store(brand name Liquor City) that stalked wines and spirits at what appeared to be prices without the notorious VAT. Mr. Price is also way cheaper than Nairobi's, and you will buy items at the same price you would purchase the same back in a supermarket in Nairobi. Woolworth's is also less costly, but will typically have higher prices than Mr. Price. At the upper end, you have brand store like Levi's , Foschini and Zara which you will find in some malls, like Sandton City. Even more surprising, is that across the road from FourWays Crossing, was an even bigger mall, FourWays mall. Shopping in South Africa seems to be more of a mall affair, they are everywhere, and larger than your average Nairobi mall. 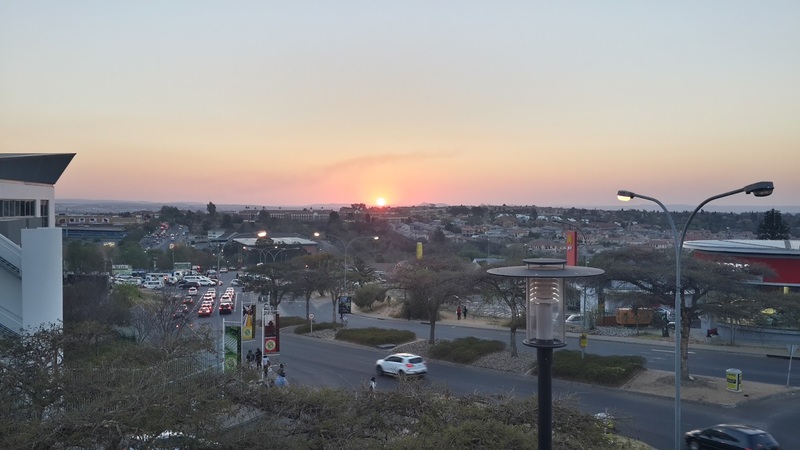 While many go shopping at Sandton City, it does contain the same brand shops you will find in a typical South African mall, but have the less common high and mid-end stores such as Zara and the rest. So unless you are doing high-end fashion, a nearby mall will do. Also, you barely spot stalls, most shops are brand names, such Spurs, Pick'n'Pay, with outlets everywhere. Clubs too, are a brand name affair, you go out at a mall, where you have a choice of Capello, Hooters and News Cafe. I did try out Capello in FourWays. For some reason, Hooters, just across the parking lot, seemed to have an older and whiter audience. Capello is partitioned into two, a restaurant, and a pub, with a verandah. You can order alcohol from the restaurant, but eating in the pub may be next to impossible due to all the activity. The particular evening, they did have karaoke, where they revellers did a good job of singing along to western hits. Though they play South African music in clubs, they don't play other African music, neither do they play Jamaican(dancehall). If you like something, or someone at the club, all you do is have buy them what they are drinking, and have the waiter deliver your card and the drink. You may also spring up a conversation - they seem not have issues like in Nairobi where robbers pose for pick ups in some clubs. I also gathered that clubs here hire people to dress and look good! It's not that they look bad, South Africans generally seem to have an ample spread around the calves and bosoms. Also at the club, as it get's late, you might see the police drive in and camp at the parking lot. They then wait for some chap to drive out, before following the person to check if they are drunk driving. When it comes to drinks, in addition to what we have here, they do have sparkling apple and sparkling grape juice. They are called appletiser and grapetiser respectively, and they are quite sizzling. I recommend you try them when in South Africa. For navigation, as usual, I relied on Nokia's Here Maps, which as I've stated earlier, once accessed when you have WiFi at your hotel, or elsewhere in the city, will work around the city with no internet connection. I did use the map at some point to help a whole lot of us decide which route was to our hotel at a crossroad. Based on sight, we were choosing a longer, round route. You can bookmark your hotel, such that finding your way back is easier. Finally , you can claim up to 11.5 percent back in taxes at the airport. You will need proof of purchase, items purchased, and to be at the airport four hours before your flight, since the process does take some time. Oh, one more thing - while firms here normally lease floors in a building, Johannesburg has such large enterprises that they occupy whole buildings. Furthermore, there are lots of companies that you have never heard of, that occupy whole multi-storey buildings - That's how big they are! A huge thanks to one Bobby Mwirigi for the images. Mwirigi writes on mobile technology and is an expert in matters Nokia. Follow him on Twitter. Liked the piece, please share it to your friends on Twitter, Facebook and recommend it on Google+ using the buttons below.